DSOs have been designed for a wide multitude of applications in industrial, education, and service applications. For ease of operation the Autoset function allows for signal related automatic set-up of measuring parameters. On screen readout and cursor functions for voltage, frequency, and frequency measurement provide extraordinary operational convenience. Fifteen different user defined instrument settings can be saved and recalled without restriction. The valuable Program mode is able to help users to record all the necessary measuring steps and replay all steps again. The special Go-No Go function is useful for distinguishing pass or failure conditions. 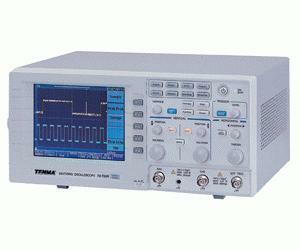 This scope offers the right combination of triggering control, frequency response, and time base versatility to facilitate measurements in a wide range of applications in laboratory as well as in field service use.